This post was originally published here on September 28, 2013. I’ve updated the text and photographs in an effort to entice you to try this recipe! It’s time to bust out the butternut!!! My love affair with butternut squash goes all the way back to my childhood. It was my Grandfather’s favorite crop to grow on our family farm. And I have many fond memories of the two of us being out in the fields together, kneeling side-by-side between the rows of plants, harvesting bushels of butternut squash until my little hands were sore and blistered. My Grandfather also loved giving tours of his butternut squash fields. And his Cadillac (how’s that for a farm vehicle?) was always full of the stuff this time of year. So much so, that we just started calling the Cadillac the “butternut mobile”. I think of him often during butternut squash season. And every dish I make with his favorite vegetable (technically a fruit, but let’s just let that go for now), reminds me of him. 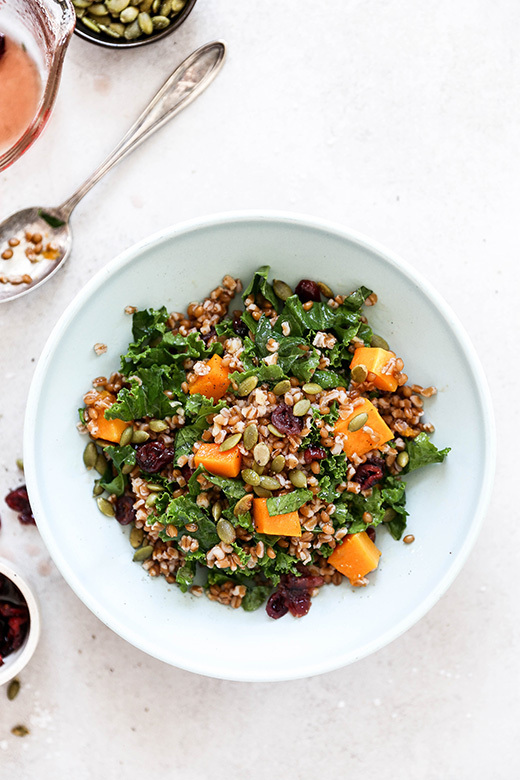 So given that it’s full-on butternut squash season AND that we’re slowly but surely inching our way towards Thanksgiving, I thought that resurrecting this Wheat Berry Salad with Whiskey-Soaked Cranberries, Kale and Roasted Butternut Squash from many moons ago would be an excellent idea. It’s got all the Fall salad vibes that I just know you’re going to love. And it has booze. So we’re winning all around! Ok. I don’t want to “bury the lede” as they say, so let’s talk briefly about the cranberries. I soak them in whiskey (you can also try bourbon or brandy) until they are plump and bursting with boozy-ness. And then I toss them into this salad. Done and done. They add the perfect little kick to this recipe. And I know you’re going to be a big fan of them. I also incorporate some of the leftover soaking liquid into the dressing, too. Because it would be far too wasteful to just dump it down the drain afterwards! 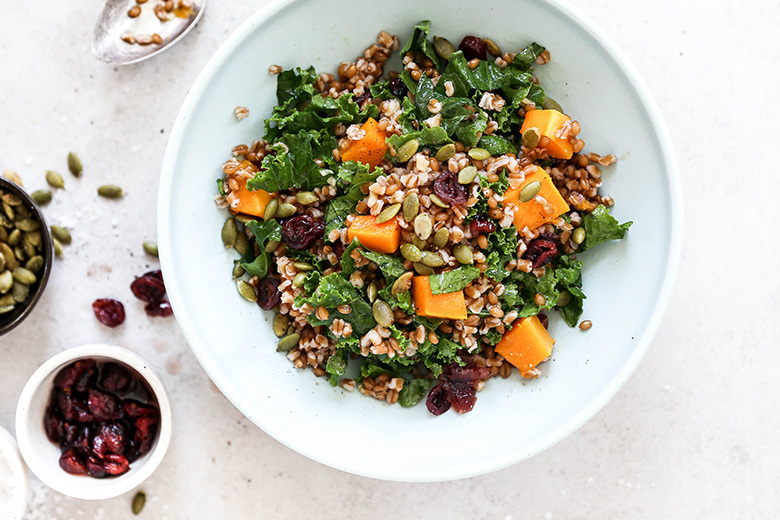 The bulk of this salad is made up of roasted butternut squash, sliced kale leaves and cooked wheat berries. I’m a big fan of using wheat berries in salads during the cooler months, because they have a lot of “chew” to them, which I find supremely satisfying. They do take a bit longer to cook than some other grains, but I think they are worth it (and if you’re a meal-prepper, you can cook up a big batch on the weekend and keep them in your refrigerator for the week). 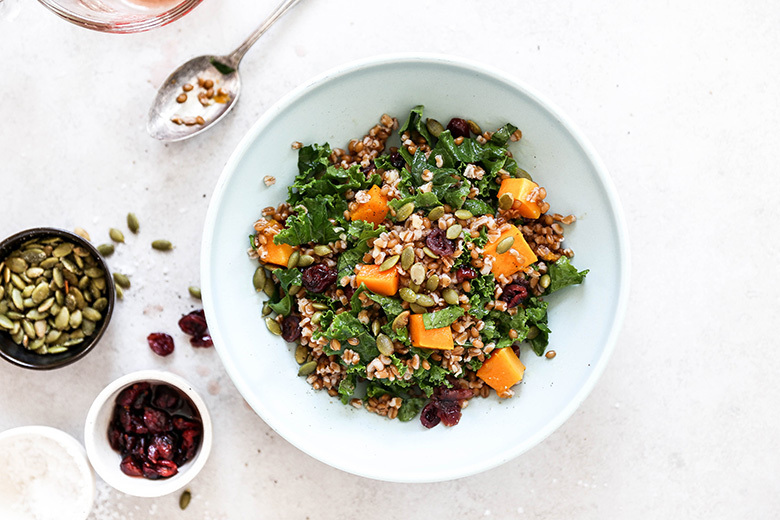 This Wheat Berry Salad with Whiskey-Soaked Cranberries, Kale and Roasted Butternut Squash is an ideal dish for the Holidays. It’s great served slightly warm, room temperature or cold. It won’t immediately get all limp and soggy. And it’s has booze! Did I mention that part already? I think I did. In a small bowl, combine the dried cranberries and whiskey. Cover the bowl and let the cranberries soak at room temperature for at least 2 hours or up to overnight. Strain the cranberries, collecting and reserving the soaking liquid in a separate container. Set aside. Meanwhile, combine the water, wheat berries and 1 tsp. of the salt in a large pot set over medium-high heat. Bring to a boil. Then reduce the heat to maintain a simmer. Cook, covered, until the wheat berries have plumped and started to split open, about 45-60 minutes (check the package instructions for recommended cooking times). Drain the wheat berries and transfer them to a large bowl. Cover to keep warm. While the wheat berries are cooking, pre-heat your oven to 400 degrees. Toss the butternut squash cubes on a large rimmed baking sheet with the olive oil, black pepper and the remaining 1 tsp. of salt. Roast in your pre-heated oven for about 20 minutes, or until the butternut squash cubes are soft and starting to brown in some places. Remove and set aside to cool slightly. Whisk together all the ingredients for the dressing. Then pour the dressing over the warm wheat berries, tossing to coat. Fold in the drained cranberries, roasted butternut squash and sliced kale. Serve warm, at room temperature or chilled. Top with pepitas before serving. Leftovers can be stored in an airtight container in your refrigerator for 2-3 days. Another great salad, Liz and love the whisky addition! Thanks, Jennifer! 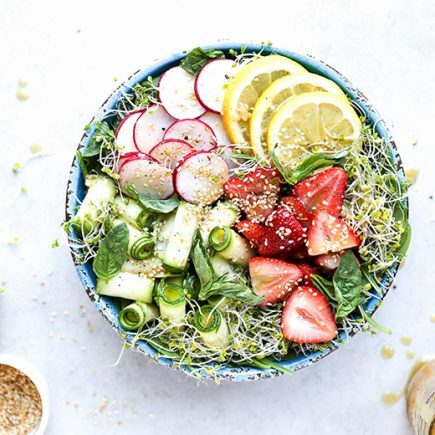 You can never have too many salad recipes! I am a lover of the juggernaut of all squashes; the butternut. Paired with your whiskey-soaked cranberries… oh my! This is great for the holidays. I included a link to your recipe on my Thanksgiving inspiration post, I hope that is ok with you! Thank you for sharing! Yes that is fantastic. Thanks, Renee! So glad you like the salad! Such a great idea to mascerate those cranberries in whiskey Liz! 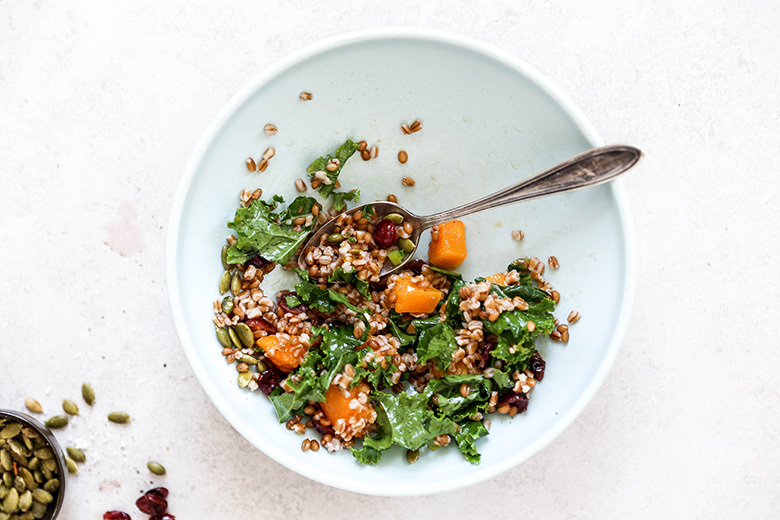 I’m in loooove… and I adore wheat berries (sadly I’m missing them because of the gf thing)… they make such a hearty addition to any salad. Delicious and SO beautiful, Liz! Ahhh yes, the gluten. That darn thing! I think wild rice would be a good *almost* as hearty substitute!